If you find yourself Googling “Toronto Flower Delivery,” you’ll notice there are a dizzying number of florists in the GTA. It’s important to do your research on who the best florists in Toronto are to ensure the quality and quantity of your bouquet meets your expectations. Whether you’re looking to celebrate Valentine’s Day, Mother’s Day, Christmas or a Baby Shower, nothing says “I love you” like a beautiful bouquet delivered straight to your loved ones door. We researched the best Toronto Flower Delivery services in the GTA and put together a guide to showcase our favourite florists. When you research Toronto Flower Delivery online you’ll find a variety of services, from FTD Florists to your favourite neighbourhood flower shop. After interviewing many of Toronto’s top florists we thought it was important to distinguish between an FTD florist and boutique business. What is an FTD Florist? FTD florists tend to have the highest performing websites when you search online for “Toronto Flower Delivery.” FTD Florist’s are easy to spot as they have websites with a similar design, showcasing stock images of standard bouquets. Canadian FTD Florists such as Bloomex offer convenient online ordering, but are often unreliable, expensive and have outdated designs. These companies simply dispatch orders to the nearest partner florist, which often don’t have the flowers pictured in stock. This means the flowers you receive may be very different from what you expected. FTD partner florists have no connection or accountability to the customer who placed the order. They also have to give up a portion of their profits to the service. So it’s no surprise that quality and reliability gets compromised. CBC Marketplace recently launched an investigative report on Canadian FTD Florist, Bloomex. CBC had received a large number of complaints from Canadians who had ordered flowers online only to be disappointed by the bouquets they received. I organized Toronto Flower Delivery from a popular FTD florist in the GTA and half of the flowers and foliage pictured in the bouquet I ordered had been swapped out for a cheaper product. After having a negative Toronto flower delivery experience with an FTD florists I decided to only feature local flower shops in this story. These Toronto florists have a penchant for hand crafting beautiful bouquets. Many of these Toronto flower shops also focus on purchasing locally grown flowers, which help support flower farmers across Ontario. Read on and you’ll learn more about each shops Toronto flower delivery (including rates for downtown Toronto and further afield in the GTA) as well as subscription service options. At the end of our story we’ve included helpful information on how long fresh flowers last as well as how to tend your bouquet to enhance its longevity. Toronto Florist Allison Westlake at Coriander Girl in Parkdale. Coriander Girl opened in Toronto’s Parkdale neighbourhood in 2009. 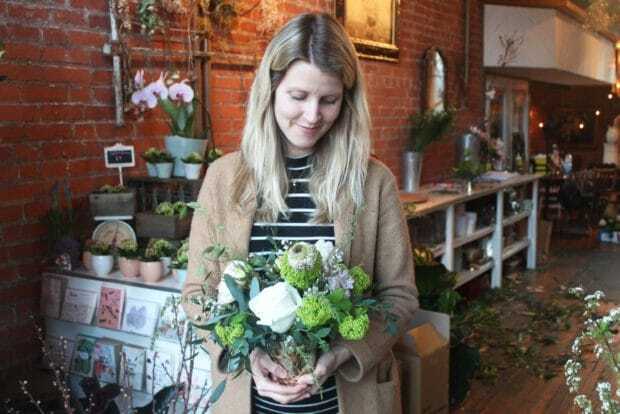 Florist Alison Westlake describes the popular West End shops evolution, “I realized I had a passion for flower arranging while working for a landscape design company. I noticed there weren’t any florists doing a garden inspired look and decided to go for it. My first shop was the most quaint space, tucked in an old building in Parkdale. We’ve since expanded to two locations. Our downtown Toronto location is located in an old peanut factory, while our Prince Edward County location is in a charming old building we purchased and renovated on Main Street. Coriander Girl’s arrangements always include “wispy or dancy bits,” small whimsical blooms that create movement within the arrangement. Like the way flowers grow in the garden, Alison Westlake’s bouquets never feel stiff or contrived. The Parkdale florist loves to use ranunculus, scabiosa, tulips, poppies, garden roses, foxglove, delphinium and dahlias. Now that Alison is growing her own flowers on her family farm in Prince Edward County, Coriander Girl’s repertoire feels endless. Her favourite colour palettes to hang out with are usually in the pastel family but she also loves colour and being asked to do the unexpected. Coriander Girl offers flower delivery anywhere in the GTA and beyond. Same-day orders are available Wednesday through Saturday and must be placed before noon. Coriander Girl’s subscription service allows you to choose from 6 or 12 months of deliveries at varied price points. It’s a fun option for people who love flowers and want to send them to someone they love or even for themselves! Bouquets are always fresh, seasonal and inspired. Toronto Flower Delivery from Periwinkle Flowers on Mount Pleasant. In 2014 Toronto florist Jess McEwen launched Periwinkle Flowers in midtown on Mount Pleasant Road. McEwen grew up in the English countryside and was given her own small piece of garden to tend. The experience fostered a love of cottage garden style blooms in a riot of colours that continues to this day. McEwen later studied floristry at Humber College and worked with some of Toronto’s best floral boutiques and studios before opening her very own Periwinkle. Pop into Periwinkle Flowers and you’ll see they also carry small houseplants and giftware produced by local makers. Part of the Periwinkle mission and vision is to support and celebrate local makers so they carry a curated collection of pieces such as towels by artist Paula Lukey, candles by Murphy & Jo, ceramic pots by potter Hinkleville and greeting cards by printer Cabin. 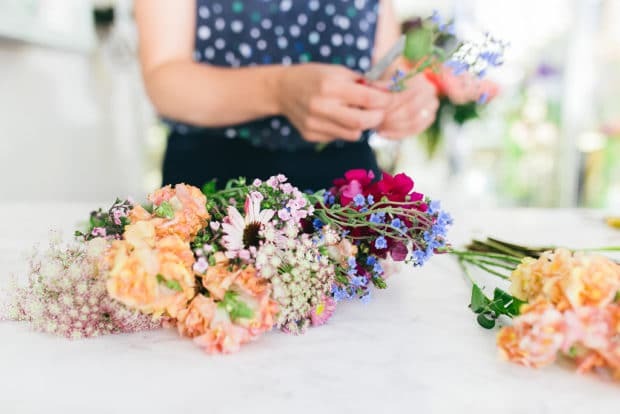 From May through to October Periwinkle Flowers carries approximately 90% Ontario grown florals, with an emphasis on buying from smaller flower farmers. November through April they import from Holland to supplement what can’t be sourced from Ontario greenhouse growers. Heirloom garden roses arrive year round from South America, but are sourced from farms that are socially and environmentally responsible. McEwen carries flowers that are seasonal, offering an emphasis on locally grown and unique garden style blooms. Periwinkle’s style is colourful, whimsical and joyful with a nod towards wild and romantic. 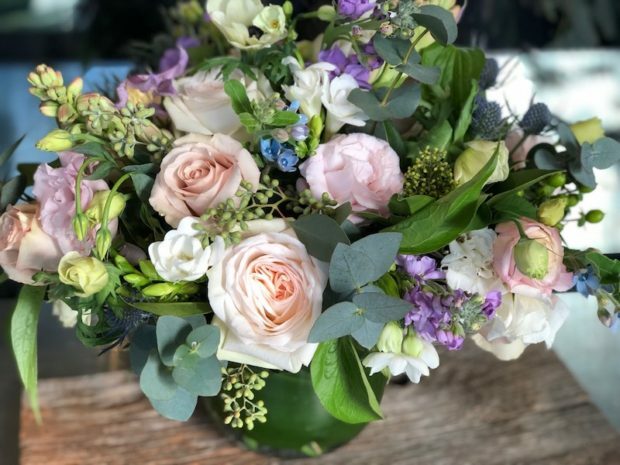 McEwen uses blooms that have an old fashioned garden feel, carrying seasonal favourites such as heirloom garden roses, sweet-peas, peonies, foxgloves and dahlias. Periwinkle Flowers delivers fresh flowers across downtown Toronto and the GTA. Orders for downtown Toronto flower delivery can be accommodated same day by 2pm. For locations outside of Toronto’s downtown core, confirm before 11am. Periwinkle offers a flower subscription program that can be purchased in blocks of four at 10% off. Toronto flower delivery can be weekly, monthly, seasonally or as desired. 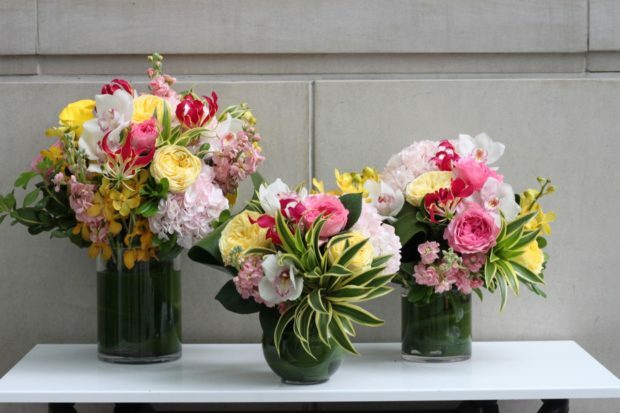 Toronto Flower Delivery: a trifecta of beautiful bouquets from Pistil Flowers. Pistil Flowers first opened its doors in Toronto’s First Canadian Place in 2010. The chic floral boutique now operates an additional shop in nearby Brookfield Place, making it one of the most popular florists in Toronto’s Financial District. Florals at Pistil Flowers are sourced locally in Ontario, as well as Holland, Mexico, Florida, Japan, South Africa, Israel and Malaysia. Pistil offers delivery services anywhere within the GTA. Same day orders must be placed by 11am to ensure delivery. Toronto flower delivery is guaranteed to businesses by 5pm and residences by 6pm. Toronto Flower Delivery: peaking inside Summerhill Market’s Floral Boutique. Family run for three generations, Summerhill Market opened in Toronto’s Rosedale neighbourhood in 1954 and has grown to be one of the city’s favourite independent grocery stores. Summerhill Market specializes in prepared foods and culinary treats, as well as fresh flowers and houseplants. Less than decade ago, Summerhill Market Floral Boutique opened across the street from Summerhill Market’s Mount Pleasant Road location offering an expanded variety of flowers, plants and giftware. It quickly became a neighbourhood favourite for fresh flower fans. Florists at Summerhill Market use a variety of premium flowers and foliage to create lush, unique, garden-inspired floral designs rich in texture, colour and eye-catching details. Inside the Summerhill Floral Boutique a walk-in cooler boasts seasonal and specialty flowers such as white and lemon green hydrangeas, sophisticated varieties of Ecuadorian roses including Green Tea, Quicksand, Mondial, luxurious blush-pink O’Hara garden roses and a variety of eucalyptus foliage. With fresh flowers arriving daily, Summerhill Market is always ready to create something unique, whether you like pastels, white and green or something bright and cheerful. Summerhill Market uses a professional delivery service to deliver throughout the GTA, as far out as Hamilton. The Rosedale floral boutique typically requires 24 hours notice to arrange deliveries. Toronto Flower Delivery: order The Farmboy from Tonic Blooms. Toronto florists Michael Smaye and Raphi Aronowicz launched Tonic Blooms in 2015. The Tonic Blooms online shop offers a curated selection of thoughtfully designed, seasonal and affordable bouquets delivered in as little as two hours. Tonic Blooms isn’t a traditional Toronto florist, in the sense that they don’t have a retail storefront. Customers can schedule an appointment should they wish to purchase in person. Tonic Blooms Toronto flower delivery service offers a handful of designs at one time, so customers aren’t overwhelmed with options and they can reduce waste. Tonic Blooms most popular style is the wild, farm-style bouquet they call The Farmboy. 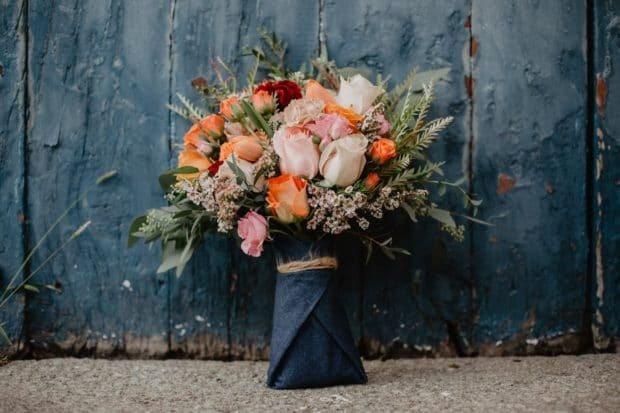 This denim-wrapped bouquet comes in three different sizes and features a variety of flowers with lots of colour and texture. No two are exactly alike. Tonic Blooms uses Ontario-grown flowers in arrangements whenever possible. The Toronto florist likes to incorporate unusual or unexpected elements grown abroad as well. These could be either tropical flowers and greens such as anthuriums and palm leaves, unique orchid varieties or even cotton stems. Tonic Blooms delivers fresh flowers across downtown Toronto and the rest of the GTA, including Mississauga, Brampton, Scarborough, Thornhill, Richmond Hill and Markham. You can schedule a delivery up to three weeks in advance. Tonic Blooms offers free, two-hour delivery from 9 a.m. to 5 p.m for downtown Toronto flower delivery customers. Orders for GTA Flower Delivery outside of downtown Toronto must be placed by 11:30am for same-day delivery by 5pm. Tonic Blooms Subscription Service: Tonic Blooms offers a discounted subscription program for Toronto flower delivery enthusiasts. Enjoy a 15% discount weekly or 10% off monthly orders. Freshly cut flowers typically last 5-7 days, depending on the type of bloom and how they are cared for. Certain blooms will finish faster than others but this shouldn’t take away from your enjoyment of the many different varieties. For example, as a society we have bred out perfume from most roses in our quest for a rose that will last as long as possible. Since emitting a fragrance uses up energy and therefore the bloom will finish sooner. Would you rather enjoy the sweet perfume of a fresh rose that unfurls and finishes in 5 days or one that sits scentless and unchanged for two weeks? The best way to ensure you get the most out of your flower arrangement is to set them somewhere they will not be in direct sun. Ideal areas in the home are not overly warm as the heat and bright light will cause them to open faster. Top up the vase with fresh cool water upon arrival to replace any that got displaced during the flower delivery process and then check and keep topped up daily. The biggest mistake people make is not adding water until several days later when they notice there isn’t any left, but by this time the damage to the blooms is already done and you will lose several days of vase life. When a bloom unfurls and then finishes, pull or snip out that stem as you continue to enjoy the other flowers. Expect it to change from day to day as the blooms open, unfurl and then slowly finish blooming. You shouldn’t need to spray the blooms as most take in water through their stems from the vase and the excess moisture on the blooms can cause problems, the big exception to this being hydrangeas that do take in moisture through the blossom, spraying these daily makes a big difference.